Like watching rugby on a Sunday afternoons, I'm afraid to admit that I'm attracted to The Calling for all the wrong reasons and who could blame me. The Calling have something of an Incubus effect where half the audience are there for the music and an equally large percentage are there simply for frontman Alex Band. It's a sad thing to admit but when you spend you life in dingy darkened venues watching sweaty men with long hair screaming about suicide and 30 something angst its a refreshing change when you get a frontman who looks likes he's dropped out of a Tommy Hilfiger commercial and has a voice which draws the emotion out of the most simplistic ordinary lyrical passages. Currently in the top 3 with the infectious "Wherever You Will Go" only being beaten by Elvis and the absurd b**tard offspring of KLF's Jimmy Cauty that is Scooter, "Calmino Palmero" is the bands debut album. Somewhere between Aaron Carter and the Black Crowes via a hint of Taylor Hanson in the the vocal technique you just wish that the album lived up to the singles potential. With the exceptions of "Thank You" and "Were Forgiven" the album veers a little too close to the likes of Train and Nickelback and this almost lethargic genre of rock music where you have to will yourself through another listen and therefore gain reward through the endless repetition of suffering. There's almost a believable world weary tone in Bands vocals which are displaced by his Dorian Gray beautiful model of perfection looks and you just realize that what we look at in the promo video's isn't what he necessarily sees when he places a mirror at his soul. Maybe instead of breaking a girls heart at every port he leaves every city and provincial town with the knowledge that his girl is still at home in LA. 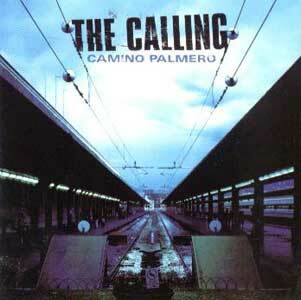 While "Calmino Palmero" is far from a great album its good to see a rock band, albeit a very commercial sounding one, charting so highly in a world of forgettable dance tunes and boy band pap. Maybe with time when they work on their craft we will start to view The Calling with more relevance than just being another case of Incubus syndrome, but until then we've got a beautiful view to look at.